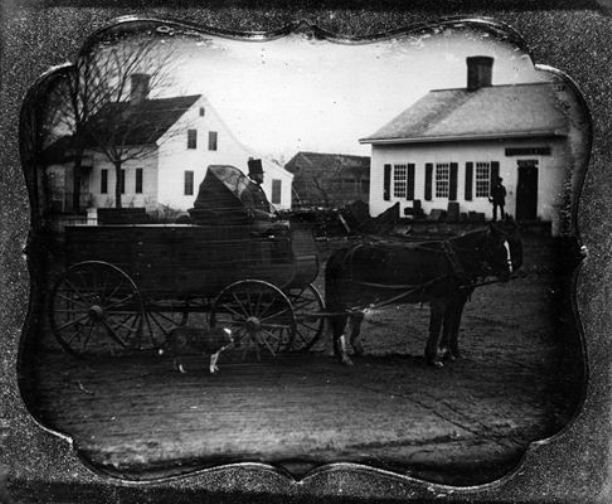 Yankee peddlers were a common sight in the Connecticut countryside in the mid-19th century. These traveling salesmen would move from town to town in carriages or carts carrying everything they had to sell. They often had goods ranging from pots and pans to hardware and spices. It is from their sale of nutmeg that Connecticut received one of its nicknames, “the Nutmeg State.” Legend has it that crafty peddlers would substitute wooden nutmegs for the real thing and sell the imposters to unsuspecting customers. Many people believe that this legend is false, because the time and cost of carving wooden nutmegs would have outweighed the cost of simply selling the real thing. Eventually the peddler business began to fade in the later 19th century due to the flourishing empire of catalogue sales from companies such as Sears & Roebuck.